Exceptional quality pure silver coins: The 1917 Walking Liberty and the 1964 JFK half dollars. John F Kennedy, born in 1917 in Massachusetts, became the youngest US President to be elected at just 43 years of age, as well as being the first Catholic ever to do so. In his inaugural address, he spoke of the need for all Americans to be active citizens, famously saying, “Ask not what your country can do for you; ask what you can do for your country”. The assassination of John F Kennedy in 1963 shocked the world. The following year Kennedy was honoured on the US silver Half Dollar – the 1964 coin obverse depicts a left profile portrait while the reverse features the presidential seal, the official coat of arms of the US presidency, encircled with “UNITED STATES OF AMERICA” on the top and “HALF DOLLAR” on the bottom. 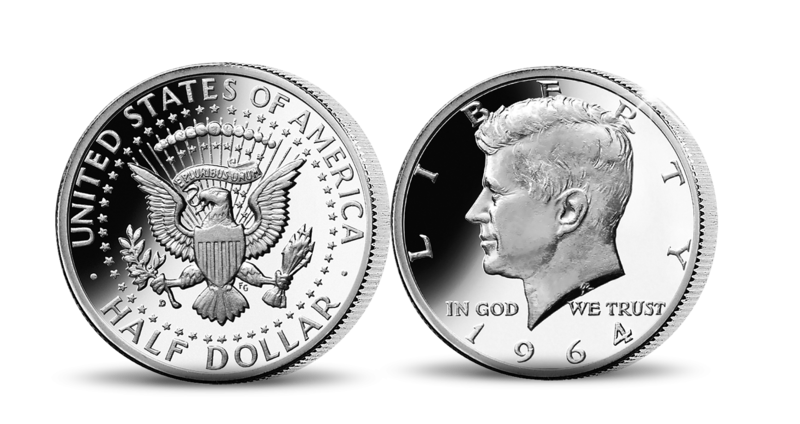 The edition of this silver set is limited to 1917 sets in honour of the year of Kennedy’s birth. The 1917 half Dollar features the beautiful design of Lady Liberty walking tall and carrying branches of laurel and oak. The reverse bears the majestic bold eagle, perched upon a crag with its wings unfolded.